What you wear is a visible portrayal of the things you believe in. People see and think about those things even before they know your name or what your interests are. 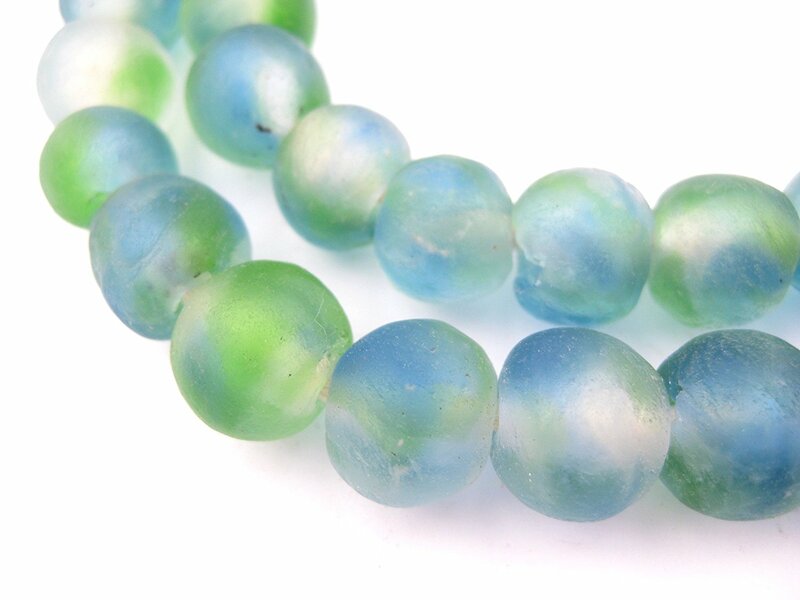 These blue green glass beads present a lovely first impression – and they also help women rise above their environment to make a better life for themselves. The necklace is made from recycled glass beads which are about 10-12mm in diameter each. The hole within is about 2mm. They actually make these beads from recycled bottles! Think of it. Glass bottles which would normally be thrown into the dump, and fill our Earth with needless waste, are now becoming items of beauty. Not only that, but the process helps families. You can leave the beads on the supplied string or you can restring them onto whatever chain or rope you would like to use. Heck, you could make a pair of bracelets out of this if you wished. Give one to a friend and keep one for yourself. The swirling color is just lovely and soothing. Serene. Peaceful. Symbolizing growth and restoration. The project is coordinated by members of the Krobo tribe in Ghana.